Many years ago (ok, not that many but 5 years in virtual land is a lot! ), I decided I was going to interview people who inspire me. Since then, I have been doing so as often as I can. Here are all my superstar interviews. When I first decided to try to reach these people, I set my goals quite high and even made myself laugh at the thought of ever accomplishing the goal of meeting and/or interviewing the Woz. 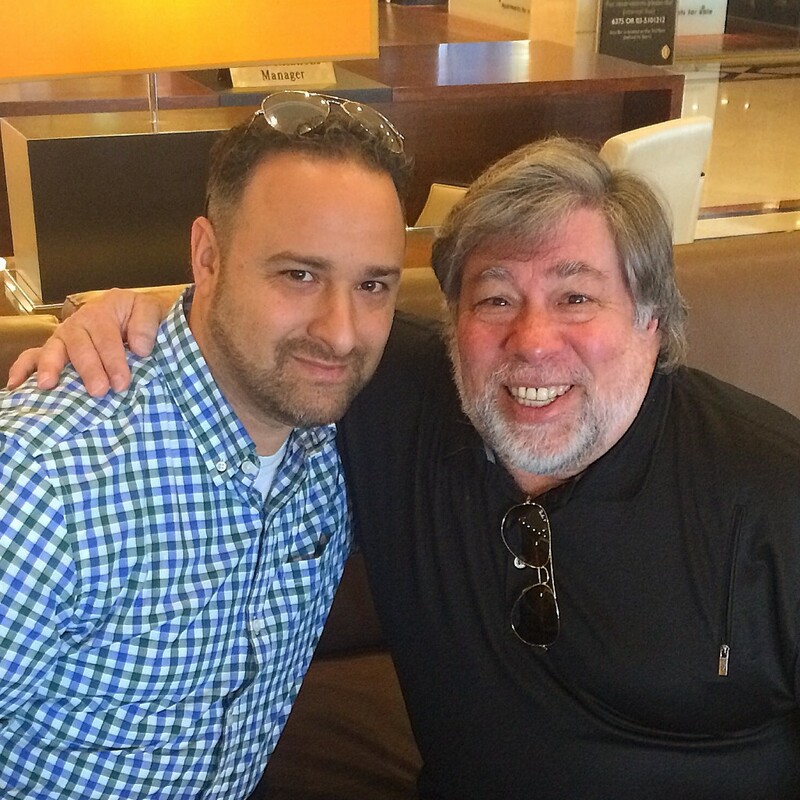 Well, it took me all those years but then a few months back, I managed to land my Woz interview. That is old news though, so why am I telling you this? 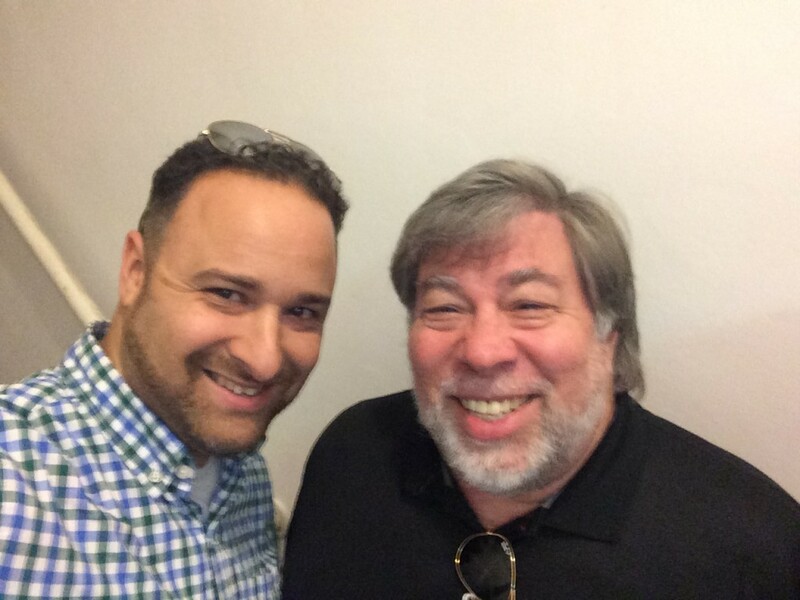 Well, because, it didn’t end there… Fast forward a few months and I get a call from a friend telling me that the Woz would be visiting Israel. I had to ask him to repeat himself since Israel was in the midst of a war in which rockets were falling on all of Israel hundreds of times a day. I had heard right. 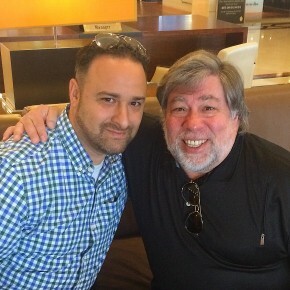 Woz was indeed visiting the holy land. At that moment I said to myself “There is no freakin chance that man is leaving this country without meeting you, you hear me? Repeat after me. 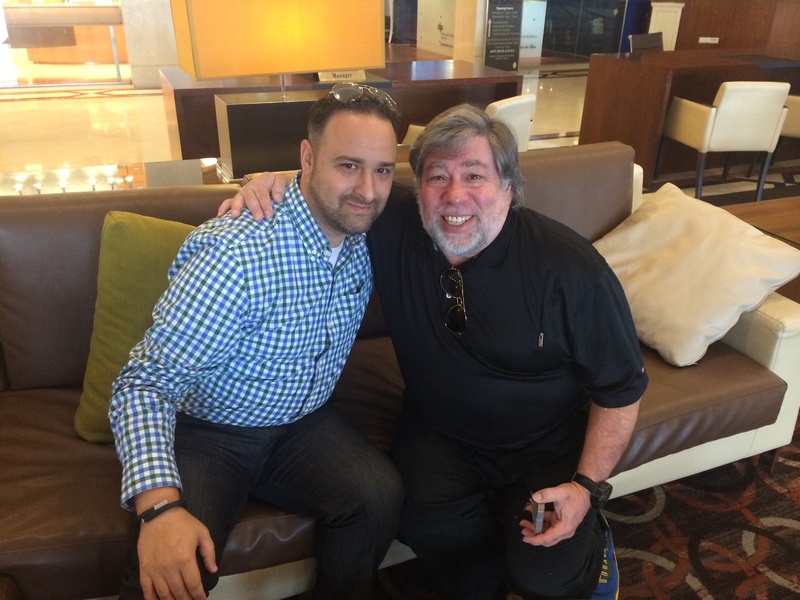 You are meeting the Woz!” Well, I set out to make this a reality. First I emailed Steve letting him know that I knew he was coming and kindly requesting that he find the time, even an hour to grab coffee. The thing with Woz is that he is awesome and despite his rockstar status, he responds to emails. No, he does not respond to every single one of the thousands of daily emails he gets, but when it is relevant and when it is from someone he knows (remember, I had interviewed him a few months back. ), he replies. And his reply was basically, “Yes, I am indeed coming to Israel. An hour? Very low chances I will have a free hour, maybe more like 30 seconds. And I have no idea yet, but let’s be in touch closer to the date.” I was happy he had responded, but was dreading the Hunger Games that I had imagined I would have to endure to get to Woz when he was here for 48 hours only. I emailed him once or twice again as the date approached. Ok, maybe it was a bit more than once or twice. He always replied saying there is a chance but hard to tell. Well, the day he arrived, I went into warrior mode and reached out. As I sent Woz an email with the subject “What’s your day like tomorrow?”, I definitely had to pinch myself at the thought that I am emailing the founder of Apple so casually knowing full well that he would reply to me and there was even the slightest chance of meeting him. Well, Steve replied and said he would be meeting some startups including ZUtA Labs (who he mentions in the video) the next day for breakfast and I should join. No, I didn’t jump up and down at that very second like a school girl meeting Justin Bieber for the first time, why do you ask?? If you think I slept for one minute that night, you are sorely mistaken. We set to meet at 8 AM in his hotel in Tel Aviv. The ride is generally an hour-long, but I think I took an extra two hours, just in case. No, not really. I was in the lobby of the hotel at 7:45 truly feeling like I was going backstage after a concert performed by my favorite band. I went to the reception to confirm that I had not imagined the email exchange and verified that the Woz was indeed staying there. They smiled and nodded. Now, I wait and hope he doesn’t change his mind… But sure enough, a few minutes later, the legendary Steve Wozniak exits the elevator and that is when the oxygen ceases to enter my brain. Honestly, totally surreal. I walked over and he said “Hi, Hillel!” Even more surreal. Then we sat down on the couch and talked. We talked for a good 30-40 minutes before any of the other people showed up. Woz told me some truly inspiring stories about the early days at Apple. He told me what it was like to build the world’s most successful company, and what it was like to work with Steve Jobs. We discussed his email overload problem and how we are trying to address exactly that at Zula! He loved the vision! He talked to me about his passion for education, which was the thing that brought him to Israel in the first place. We discussed Israel, we discussed innovation, and we even discussed politics. Since he wrote it publicly on Facebook, I am ok sharing here that he said what many of us regular folk understood a long time ago. If the Palestinians put down their weapons and stop shooting rockets at Israel, the next day there will be peace. I will add what Netanyahu has so famously said, if Israel puts down its weapons, the next day, there will be no Israel. Wait, did I just go political in a blog post? That’s a first! But then something happened… A rocket! Shot from Gaza heading toward us. Yes, really. So, there I was with the founder of Apple running toward a bomb shelter to shield ourselves from rockets. It truly does not get more surreal than this. Here is us in the bomb shelter of the hotel! Back to Woz… Anyway, we sat for the total of close to two hours I believe, but I honestly did lose track of time. He told me how he never aspired to be a rich man and how he gave away hundreds of millions of Apple options to the engineers who built the company and to whom Jobs did not want to give anything. He told me that the Jobs movie was far from accurate and many of the events there never really happened, like for example, him telling Jobs that he is leaving Apple. Never happened! I tried to understand if he was bitter about the way Jobs ran the company and how they were such different people but it became clear very fast that he had nothing but the utmost respect for Jobs, as a partner, and as he told me “A brother”. All in all, the meeting was truly epic. No, not the type of “epic” people overuse on social media. Truly really epic! The Woz is obviously somewhat of a celebrity, he is clearly a technological genius, but hands down, what impressed me most about my few hours with the Woz was that he is a totally normal and down-to-earth guy. Zero ego, just a plain nice guy. He gave me his legendary business card, which is made out of sharp aluminum and he confirmed the urban legend that he made the cards to use to cut food on planes. Yes, they are that sharp. He showed me the insanely geeky watch he was wearing, which was like nothing I had ever seen before and seemed to have an accelerometer in it. As Woz talked about tech, the sparkle in his eye was both inspiring and truly interesting to watch. This man has a passion for technology the likes of which I have never seen and probably never will again! Watch the quick video interview below, in which we discuss his first experience visiting Startup Nation!